A bag and bowl of Lay’s Wavy Milk Chocolate Potato Chips. When most well-adjusted, liberty-loving North Americans think “chocolate chips,” it’s the classic cookie that comes to mind, not potato chips drenched in chocolate. And yet here we have Lay’s Wavy Milk Chocolate Covered Potato Chips, an idea that seems certain to have come from a skunk-scented apartment in the college part of town. More curious than the oddball snack combination is how Lay’s is positioning these. The packaging aims for classy, a cut above a typical chip bag. Perfect for a special occasion, the bag seems to be saying – an assertion backed up by a premium price point. 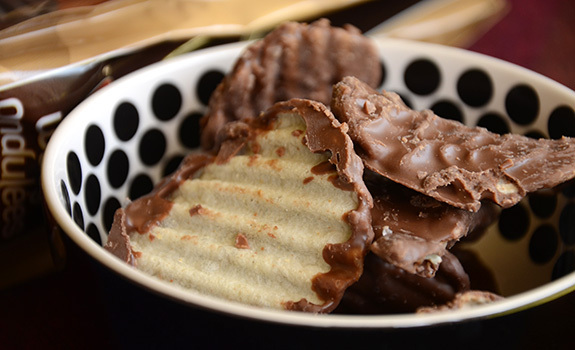 The result is a thick, wavy-cut chip with a crunchy but soft texture as the base, and a layer of sweet, creamy milk chocolate liberally applied over one side of the chips. They look surprisingly homely and quite unlike the glam shot on the packaging. The chips are a shade darker than sickly all-purpose-glue white, and the chocolate looks like it was thrown onto them in a hurry; there are smears of chocolate on the exposed backs of the chips, some are stuck together, and most show the wear and tear of being jostled around in the bag during transport. But damn, do these things taste great. Foodies have grown used to the pairing of salt and chocolate, though this usually involves fancy things like “fleur de sel” or “salt harvested from the evaporated tears of heartbroken Himalayan yaks” instead of potato chip salt dust. Here, the salt is wonderful, with extra layers of awesome coming from the oily potato taste and slightly crunchy texture of the chips. The sugar from the chocolate hits with the same intensity as the salt, and combines with fatty goodness in the mouth feel. Result? They’re spectacularly addictive. Note: While you can leave a bag of Doritos in the car with few ill effects, I’d advise against leaving these in anything above springtime-in-Alberta room temperature. Since the chocolate easily melts off on your hands as you eat them, I can only imagine what a mess they’d be in the bag after an hour in a Toyota’s sunny front seat. 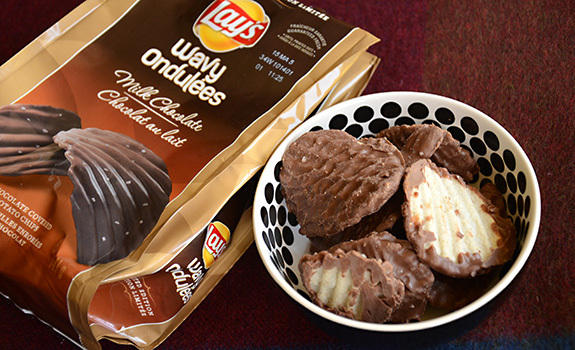 These Lay’s Wavy Milk Chocolate Potato Chips look, for lack of a better word, sloppy. But if you can get past the look of the things, they’re ridiculicious. Cost: $4.99 for a 141 gram bag at Shoppers Drug Mart in Edmonton. Value for cash money: More expensive than either a chocolate bar or a bag of chips. And unless you do all your grocery shopping at 7-Eleven, it’s also more expensive than a chocolate bar AND a bag of chips, combined. In other words, not great value. Availability: Errywhere. The package says “Limited Edition,” but I’ve seen them in drugstores, corner stores and megamarkets for the past few months. Are they going away soon? I have no idea. If they sell well, “limited edition” products have a funny way of never entirely going away. Nutrition: Per 5 chips (50 grams): 270 calories, 16 grams of fat, 170 mg of sodium, 2 grams of fibre and 3 grams of protein. Since a single standard chocolate bar in this corner of the world runs in the 200-250 calorie range, eating only five chips has more caloric impact than an entire chocolate bar. Nasty. The verdict: These have no business being this good. If you like sweet and salty together, these are fantastic.